While it's often useful to link to an image, thanks to the security features in Outlook and many other email clients, users may choose to not download your image. For this reason, we recommend using embedded images. But you're not going to make many friends if you start adding 30kb graphics to the end of every message you send. Use this feature wisely! Is it better to send an embedded image or a linked image? There are pros and cons to either method. For greatest visibility, embedding is usually better, but if you plan to change the image often, linking would be better. If you use an embedded image, the message size will be larger (because of the attached image) but the recipient will see the image even if they are offline or when they look at the message years from now. However, they'll only download the image once, which makes it bandwidth-friendly. If you link to an image, users could block external content, so they won't see the image and they won't see the image if they are not connected to the Internet. The image may download every time they view the message, which could increase their bandwidth costs. If you delete the image from the web server (or rename it), the signature will show a placeholder and error. However, as long as you use the same file name (and for best results, the same file dimensions), you can update the image on the web server and recipients will see the new image any time they look at your messages. When using images in your signature, you should use an image editor (such as SnagIt or MS Paint) to resize the image so its the exact size you want to use in the signature. Do not insert a 500x300 image then resize it to 200X100. Resize it before inserting it. Also, the image should be 96 DPI/PPI. In File, Options, Mail, click on Signatures to open the Signature editor. If you have a signature you want to add an image to, select it, otherwise click New to create a new signature. Position the cursor where you want the image then click the Picture button on the right. Select the picture and click Insert to insert the image as an embedded image. This will include the image as an attachment. If you want to add a hyperlink to the image, click the Hyperlink button. Note: The inserted image should be selected immediately after inserting it, if you add a hyperlink later, you'll need to select the image first. Images added to signatures using the steps above will embed the image as an attachment. In some mail clients, the recipient may see the attachment icon, but Outlook and many other mail clients will render the image in the signature and hide the attachment icon. If you prefer including a linked image on public web site, Outlook 2013 and up make it easy to create signatures that link to images on the web. Warning: if you are using an image on your local computer, choose Insert to embed the image. Otherwise, Outlook will send a link to a file that may not exist on the recipient's computer. 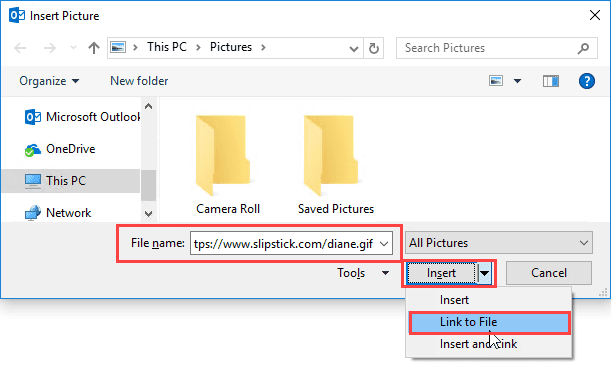 Type or paste the URL to the image in the Filename field. Place the cursor in the signature at the location where you want the image. With the image selected, click the Insert hyperlink button. Type or paste the url into the Address field. This video shows how to add an image to a signature and hyperlink it. When the image is added to the signature using this method, the image is included in the message as an attachment. Note: In Outlook 2013 and up, the behavior changed and images are linked by default. You only need to use the registry key (with a value of 1) if you want to force images to be embedded. You can set Outlook 2010 and 2007 to use images from the Internet, however it must be configured in the Registry. Once you do this, use the steps above to link to images. Open the registry editor, browse to the HKCU\Software\Microsoft\Office\14.0\Outlook\Options\Mail key, then right click on the Mail key and choose New, DWORD and create a value named Send Pictures With Document. The default value will be 0, which is the value we want. When the value is 1 or if its missing, images are embedded with the message, not linked. You'll need to restart Outlook after changing this registry key. If you don't want to edit the registry, we have a ready-to-use registry file you can download, then double click to run. We recommend right clicking on the link and choosing Save Link As (or Save Target as). Don't forget to restart Outlook! Have you checked the junk mail folder? What antivirus/antispam software do you and your email provider use? I'm wondering if they are filtering on the url. I had problems replying to a guy once because his phone number was in his signature and that caused it to be flagged as spam. For some reason this url will not be accepted by outlook 2010, I can put other urls in and they work, is it anything to do with the url that causes this problem. It works here on my test machine so it's not the url. Does it just not insert it or does it give you an error message? We're both using Outlook 2010 on Windows 7. Offhand, no I don't have any suggestions. I assume he restarted outlook? I've been able to successfully set this up on my iMac's virtual PC (running Windows 7). However, many others in my office are unable to get Outlook to not attach the signature images as attachments. I'm thinking it has to do with the registry edit. I myself did not have the "Mail" key/folder in my registry, so I created it and then created the DWORD value. My coworker ran into the same thing, so I walked him through it the same way I set it up. Sadly it's not working for him and the images are still coming through as attachments. It's very strange. Do you have any other troubleshooting suggestions? Which version of Outlook are you/he using? Outlook only displays the first frame of animated gif's - if the recipient's email client supports animation, they'll see all frames. What method are your friends using? That may work on work on messages you send, but you won't see the animation in the compose window. Can I use movable text like marquee text in the signature of outlook 2010?